Leading Manufacturer of tyvek event wristband, identification wristbands, customised id patient wristband, casino wrist bands, bar code wrist bands and thermal wrist bands from Nagpur. We offer a wide range of Tyvek Event Wristband to our valuable clients. 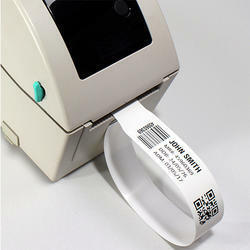 Our business is highly involved in offering a wide range of reliable Identification Wristbands to our valuable clients. We have been a pioneer and market leader in the field of bands. The bands provided by us are used in hospitals , water parks, casinos, entry tickets, Events etc. The band is provided with a glue on one side having a security feauture because of which once get stick will not come out without getting teared. So this type of bands are of one time use. Material used in making this bands is non tearable water proof, made up of Tyvek material. Material used is very light and hence the person wearing it do not feel about it, hence do not make any irritation. The material is non reactive to skin. We are having ready stock available with us of regular bands as well as diffrent colour plain bands. 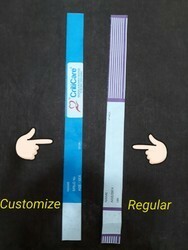 We are the manufacturer of Customised id patient bands. The Bands are one time used in hospitals , events , Entry pass , water parks , fun Zone etc. Bands are glued on one side which one gets pasted will not come out, rather it will get teared of from the security cut area. The material used in it is of Tyvek material is non tearable imported material. The said material have the properties of feel less because of its light weight , which do not cause any irritation while wearing it. Available Color Green, Blue etc. 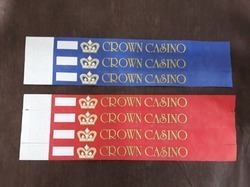 We are one of the accredited suppliers of a premium range of Casino Wrist Bands. These are available in various designs, patterns, and colors. 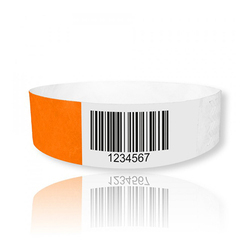 The Bar Code Wrist Band systems as more and more hospitals are choosing the coding systems to identify patients. Thermal printer bands can be printed within seconds using a thermal printer. Soft thermal band ensures greatest comfort for patients. These are available with high quality bar codes that can be scanned accurately. No laminate overlay on wrist band and labels resist moisture, alcohol and hand sanitizer to preserve patient data. The bar codes support text, linear and 2D bar codes, photos and graphics. Thermal Wrist Bands tear-resistant, waterproof and Secure. Our Stock Thermal Wristbands are made of a tear-resistant direct thermal synthetic material that is not only durable, but also waterproof. This provides your organization with a point of sale printing option using a direct thermal printer. 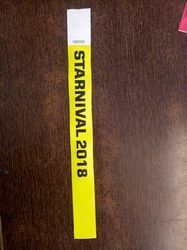 The bands are attached around your patron’s wrist using a super-strong adhesive closure; in addition there is a unique die cut pattern that helps make these wristbands more secure by showing if they were tampered with. We are offering Paper Wrist Bands. For the accurate identification of samples, treatments, patients, medications, lab results, and records. The offered products provide the foundation for improving quality and patient care. We offers a large quantity of One Time Use Wrist Bands to our valuable clients. Patient Wristband is an important way to reduce patient safety risks. Patient misidentification continues to result in medication errors, transfusion errors, testing errors, wrong person procedures, and the discharge of infants to the wrong families. Today, with as many as one million people harmed by errors during treatment at hospitals each year; identification of patient using wristbands helps minimize medical errors and administrative issues can be handled efficiently. Color coding of wristbands facilitates rapid visual recognition of specific issues and can be modified as per the requirement of the organization. We offer Patient Identification solutions for admissions, blood, mother and baby, paediatrics, disaster response, outpatient and emergency room purposes. 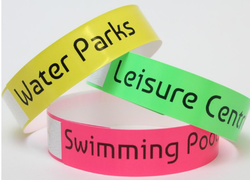 Waterparks Wrist Bands offer a great option for gate control, security, one time use and comfort wear. Tyvek wristbands are the most affordable option. Tyvek is water resistant, it has a waterproof adhesive closure and can be customized. 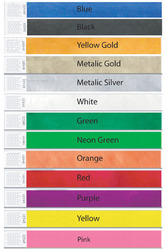 We are one of the accredited suppliers of a premium range of Color Wrist Bands. These are available in various designs, patterns and colors. This Is one time use Bands. We are offering Party Wrist Bands. 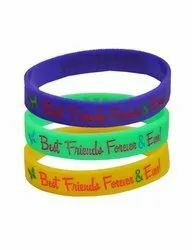 we offering a wide range of Green Color Rubber friendship wristband at best price. Looking for Wrist Bands ?